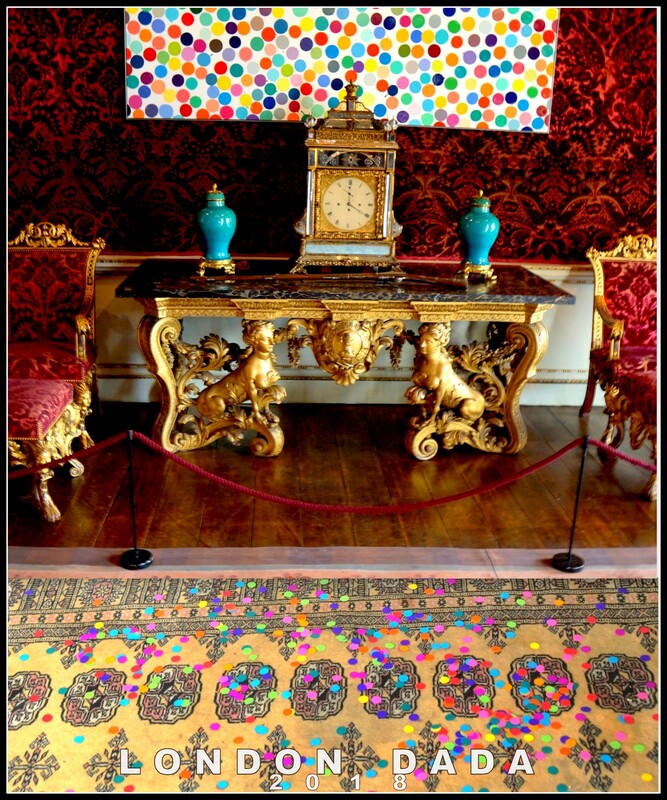 Multicolored paper spots 1cm dia scattered in front of one of many Damien Hirst spot paintings hung in Houghton Hall, Norfolk earlier this year. Links to the three previous Damien Hirst at Houghton Hall photo Works posted to our Flikr archive resource. Where do the spots go from here? ( published 04 / 09/ 2018 )The boy Hirst exhausted his regimented spots way back, then this year at Houghton Hall he exhibited them loosened and slightly overlapping..
Also at HH were London Dada’s spots, freed from their 2D world and out, but static, on the floor. So artist Michael St.Mark proposes a giant see-thru perspex container to occupy Tate Modern’s Turbine Hall, over which visitors cross on suspended walkways, underneath which, near the floor, are a bank of industrial AC fans that set hundreds of thousands of mono or multicoloured wafer-thin environmentally- friendly plastic or paper spots in a perpetual swirling snowstorm within the container. Alternatively, and probably logistically more straightforward, would be to fit the Hall with a grid-like network or challenging maze of large ( c. 7 -8ft ) diameter tubes, through which the spots are blown and circulated – and of course also through which visitors walk. A marvellous and guaranteed crowd-pulling visually immersive spectacle and experience – and at last the spots are airborne en masse and literally surrounding the public, thus finally democratising them – and the idea herewith given to Maria Balshaw for safe keeping.